The line above is paraphrasing Jaap van der Wal, who is an embryologist, and anatomist. (If you want to go deep into his theory, you can watch “The Architecture of Connective Tissue as a Functional Substrate for Proprioception in the Locomotor System“, or you can go on a slightly easier ride here.) I like this line a lot, perhaps because it resonates with my somewhat contrarian nature, and because the lecture by Dr van der Wal that I attended was both exciting and compelling. I have used this idea to argue, in a workshop entitled ‘Pilates Made Simple’, that Pilates teachers should be cueing movement rather than muscles. This seems to be a widely accepted idea in the world of strength and conditioning, but not so much in the world of Pilates teaching. I was presenting this workshop last weekend and, as expected (because of the company I was in), whilst the idea of cueing movement instead of muscles wasn’t contentious (I think), the ‘brain doesn’t know muscles’ line met with some reasoned resistance. Specifically, someone with a much deeper understanding of anatomy than mine pointed out that brain’s homunculus – its representation of our body – is partly formed by feedback that it receives from receptors within muscles. This caused me to revise my thought process – or perhaps I should say think a little more deeply/carefully about what I mean. Here’s what I’ve come up with so far. ‘Our brain knows that you’ve got muscle, but it doesn’t know that you’ve got muscles…’ – that is to say, the ‘picture’ that our brain has of our body (which van der Wal says is based upon ‘fascial architecture’) is nothing like the pictures of muscles that we see in anatomy books. So, your brain knows that there is muscle tissue in the area of your arm that is responsible for moving your wrist closer to your shoulder because it knows the area to stimulate to produce wrist-toward-shoulder movements. Your brain does not ‘know’ that you’ve got a bicep brachii muscle, and a brachialis muscle etc. Again, our brain’s representation of our body is based around fascial architecture, and muscle fibres can be viewed as ‘just’ the elastic parts that move the parts of that architecture in relation to each other. It follows, for me, that any notion that we can selectively fire muscles is largely an illusion. I know when I fire my bicep, because I’ve learned my musculosketal anatomy, and I can see the bit that’s called biceps changing shape. However, I don’t know what else is working, and I doubt that I’m able to isolate my bicep to make that movement. In other words, if I think ‘shorten my bicep’, my brain ‘knows’ what that looks like, translates it into a movement, and sends the message out ‘move wrist toward elbow’. 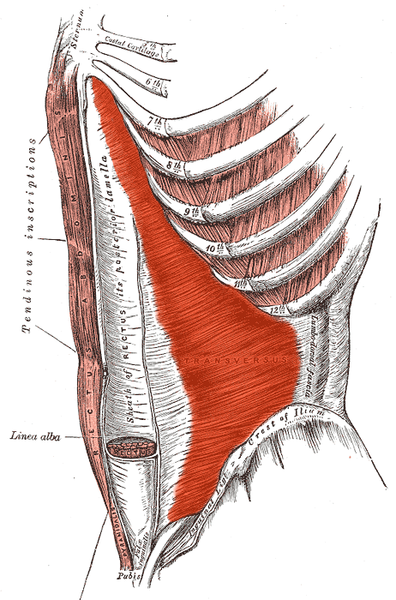 It seems that one of our favourite muscles to work in Pilates is the transverse abdominis. It’s function is apparently so critical that you can find plenty of online instruction on how to isolate it. ‘HolisticSam’ of http://endyourbackpainnow.com presents one such example on YouTube. And yet, according to Grays Anatomy “It may be more or less fused with the Obliquus internus or absent.” So it could be that HolisticSam is training someone to isolate a muscle that they don’t possess. And if that person doesn’t have an identifiable transverse abdominis, does this mean that they cannot stabilise their lumbar spine? Of course not, because their brain doesn’t know how to ‘contract transverse abdominis’, but it does perhaps know how to ‘stiffen lumbar spine’, or maybe ‘ maintain relationship of ribs to pelvis’. It also seems to me that if we had full conscious control of our individual muscles, then there ought to be far fewer problems with imbalances, asymmetries, and movement disfunction – and those problems should be easier to sort out. This may need further consideration, and it also seems to relate to another bald statement (this one I will claim as my own): ‘Poor muscle balance doesn’t cause poor movement, poor movement causes poor muscle balance’.